Trail Description: This hike was very similar to our March hike two plus weeks earlier and gave us a chance to see the difference. We traveled a little over two miles through alternating meadow and forest. Trail Location: See last picture. 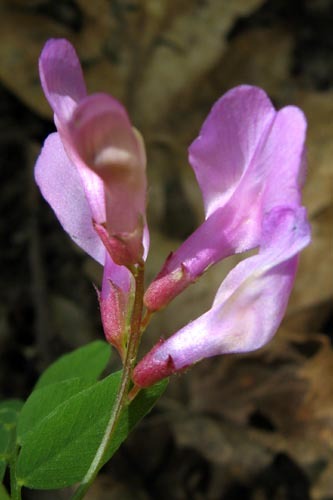 American Vetch (Vicia americana): Many vetch are introduced; this is a native. Annual Mountain Dandelion (Agoseris heterophylla): They are not that plentiful this year probably due to the lack of rain. Balloon Clover (Trifolium depauperatum): The oil is said to be used medically for nausea and flatulence. Butter Weed (Senecio aronicoides): Also called Groundsel, medicinally used for constipation. Cob Mountain Lupine (Lupinus sericatus): Lives only in California. Is listed as rare and threatened. Fringed Downingia (Downingia concolor): These like moist areas. Little Comb Seed Flower (Pectocarya pusilla): The flower is a little smaller than a BB. Pansy Monkey Flower (Mimulus androsaceus): A small monkey flower only 1/3" to ½" across. Popcorn Flower (Plagiobothrys sp. ): Likes open spaces. Common in grass. Low Buttercup (Ranunculus pusillus): The flower is less than 1/4" across. Red Bells (Fritillaria recurva): The bulb is poisonous. Sweet Cicely (Osmorhiza chilensis): The roots are said to be antiseptic. Valley Tassels (Castilleja attenuata): These are root parasites on other plants. Woodland Violet (Viola purpurea): Side view showing purple undersides. Front is yellow.